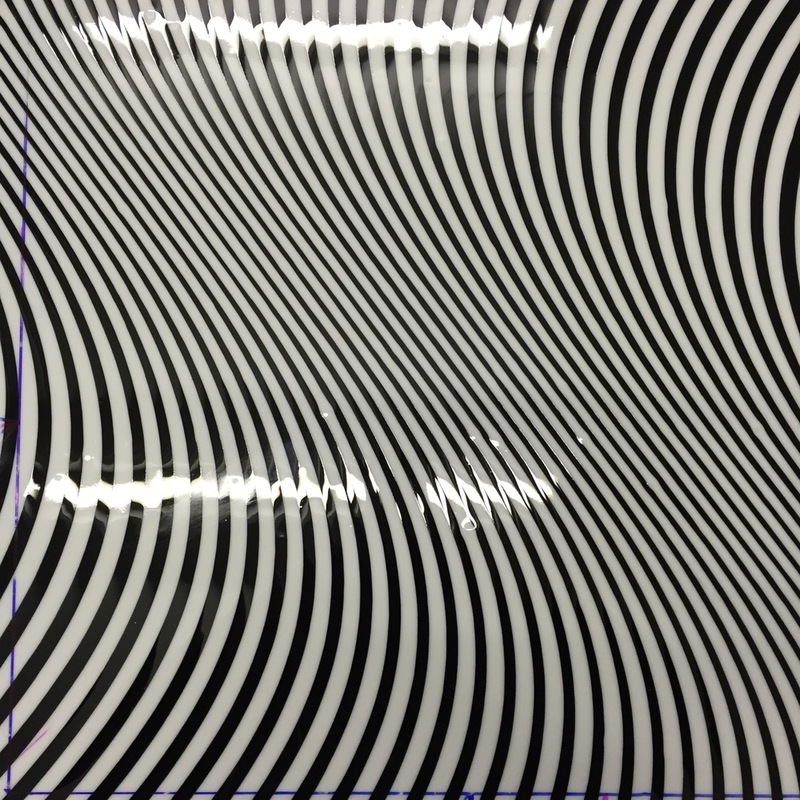 Distorted Line platters are produced using cutting-edge manufacturing technology and it takes hours on a waterjet cutter to create the unique strands needed to create this design, which are cut from sheets of opaque white and black glass. 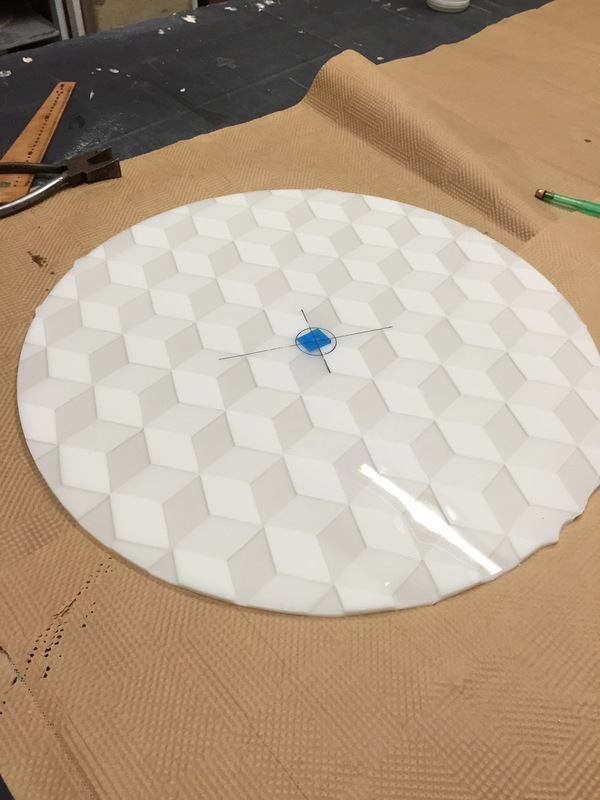 Once the strands are cut they are cleaned and laid into the design onto a kiln shelf, the loose pieces then fuse together at temperatures of around 800°C, where the tile is then cut into its final shape and worked by hand to create a soft edge. The platter is then placed over a ceramic slumping mould and fired again at a lower temperature of around 650°C to form this piece. Once complete the design creates an optical distorted curved line, this effect creates a mesmerising sensation of movement. A collection of water-jet cut Platters designed Exclusively for Collect: This collection of table-top designs will be exhibited at Collect 2017. The designs are ready and the clock is ticking. As an Artist and Designer, you are always asking, What if ? And when you are designing for the home you need to consider safety. THE GLASS SAMPLES HAVE BEEN FIRED AND ARE READY FOR ME TO SELECT. After firing the glass samples, I have selected my colours for the New Tumbling Block Bowl’s. Anew range should be coming soon. Just recently I have had my work selected by BOHA Glass who admire glass from all over the world, but are fascinated by Eastern European Glass. They decided to specialise in this area and have searched Bohemia and Eastern Europe to find the very finest studio glass artists. So pleased, to fall into that category with some of the best Czech Republics and UK’S glass artists. I have a colour palette in mind I just need to see if the colours are available. Making small glass colour samples to see how they are affected by the light. It's great designing a new collection, but at some point you have to design your exhibition space. Spent most of last week designing, making and painting exhibition plinths. so please to have that job out the way. Zigzag occasional tables are designed to create a bold graphic zigzag image that blends from light to dark. The tabletop forms a design which allows light to cast shadow beneath the table. Below shows some of the technical side to the design process, the table is designed in three sizes ranging from 90cm to 65cm. 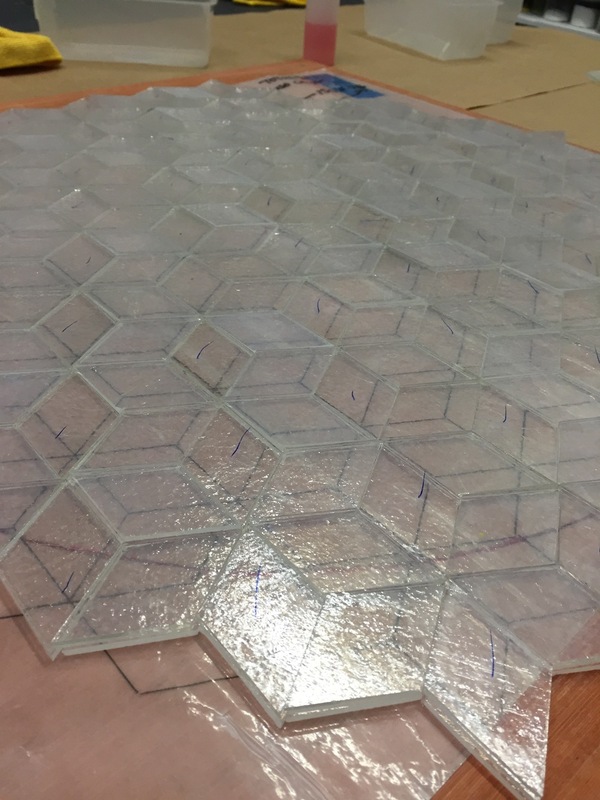 The tabletop is cut from one sheet of grey and one sheet of clear 10 mm glass and it takes several hours to cut the individual strands needed to create each tabletop. 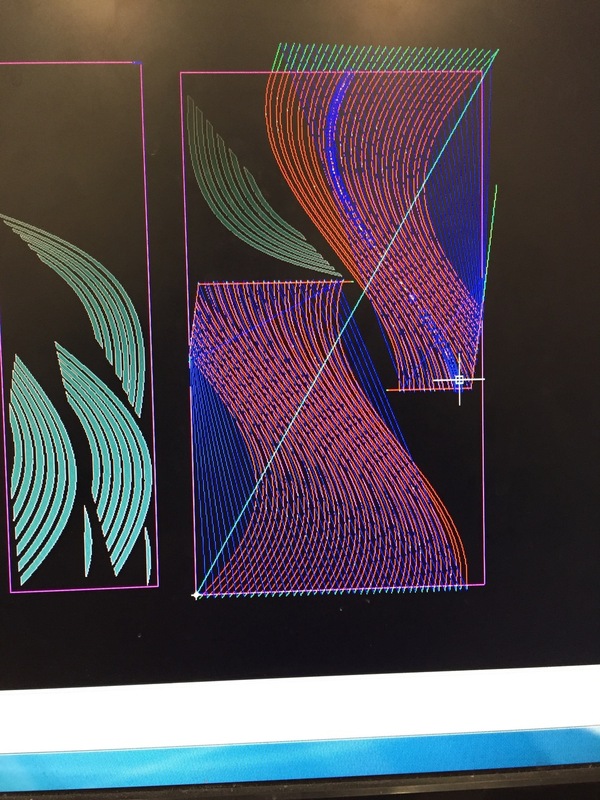 These images follow the current theme of optical illusion, using digital drawings which are converted into a CAD program for a waterjet cutter to follow. The machine uses a fine jet of high-pressured water mixed with garnet sand, to enable cutting through glass, metal, wood, plastic in fact, almost any material required to complete the piece. 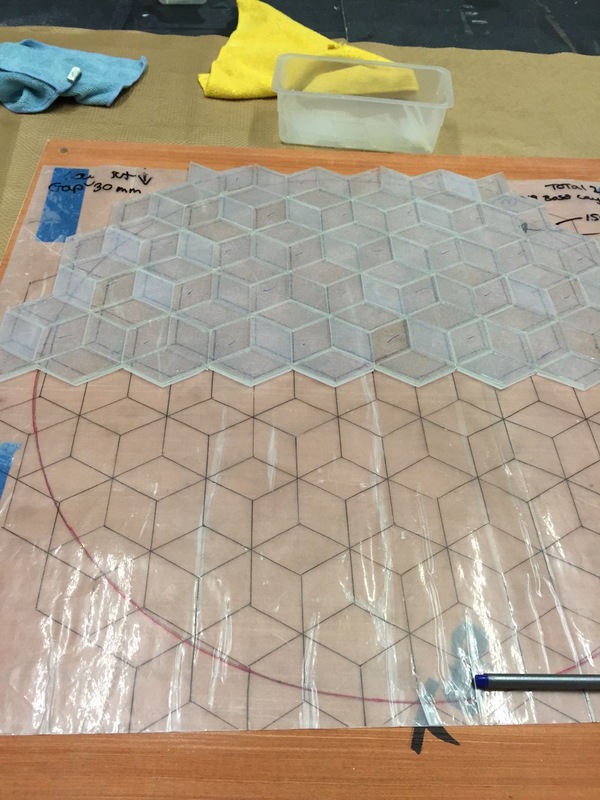 This video shows the slow process of the water jet cutter cutting through 10mm CrystalClear float glass the process with take over 5 hours to cut half the parts needed form the tabletop. This is repeated once again in the Steel Grey glass sheet and has taken all day to cut and lightly clean. Once cleaned from the garnet sand the individual pieces are pack into travel containers ready to travel back to Cumbria, where the individual pieces can be fused together. Once the strands are cut they are cleaned and laid onto a ceramic kiln shelf. The glass kiln is then fired to temperatures of around 800°C to fuse the individual strands together to form the glass tabletop. 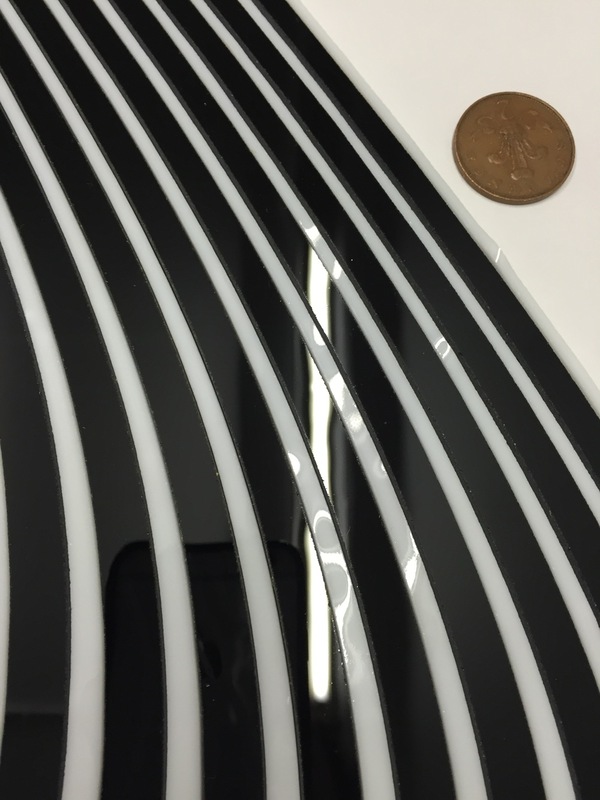 This creates a transparent sheet, the edges of which are polished using diamond tools before a penultimate process of industrial laminating to comply with British Standards. Once laminated the transparent glass sheet is placed into an engineered stainless steel box section frame, which is crafted by a skilled metal worker to give the table its final structure. The final process is to enhance the surface with a soft, satin finish to form the completed functional table: a breathtaking, provocative piece. Framework for Zigzag tabletop, made from 20 mm box sections stainless steel, and 20 mm angle bar, all metal work was completed by Neil Ivisona very talented metalworker. So pleased with the end result. The frames still need to little bit of work to the surface, which I intend to sandblast to give a satin finish. From the initial fusing of two 3mm sheets of glass to create a 6mm sheet of black then the same to create a 6mm sheet of white. Through to the cutting with the water jet cutter showing the detailed CAD drawings in which the water jet cutter follows. The Cad drawing is developed using adobe illustrator. and depending on the complexity of the design can take hours to draw. The water jet cutter is able to cut fine strands of glass around 5mm and less, which is impossible without this machine. Once cut the strands are clean to a void devitrification they are laid onto a kiln shelf and then fired a temperatures around 800 degree celsius. It takes just under 2 days to reach the top temperature and then cool to room temperature, to fuse all the individual strands together. Again once fired the sheet is cut into a square around 50cm x 50cm cold worked to give a soft edge. After this the glass sheet is placed over a ceramic slumping mould and fired at lower temperatures around 650 degree Celsius to heat the glass to the point in which the glass becomes soft enough for gravity to sag the glass which will follow the ceramic mould to form the final design. Translucent White Tumbling Blocks Bowls are made from more then 200 individual glass diamond shapes that have been hand cut from sheets of translucent white which looks almost clear until fired in the glass kiln, this is where the white colour strikes and becomes less transparent clear glass is also used to create the depth of colour and the illusion of three dimensional squares in the final design. 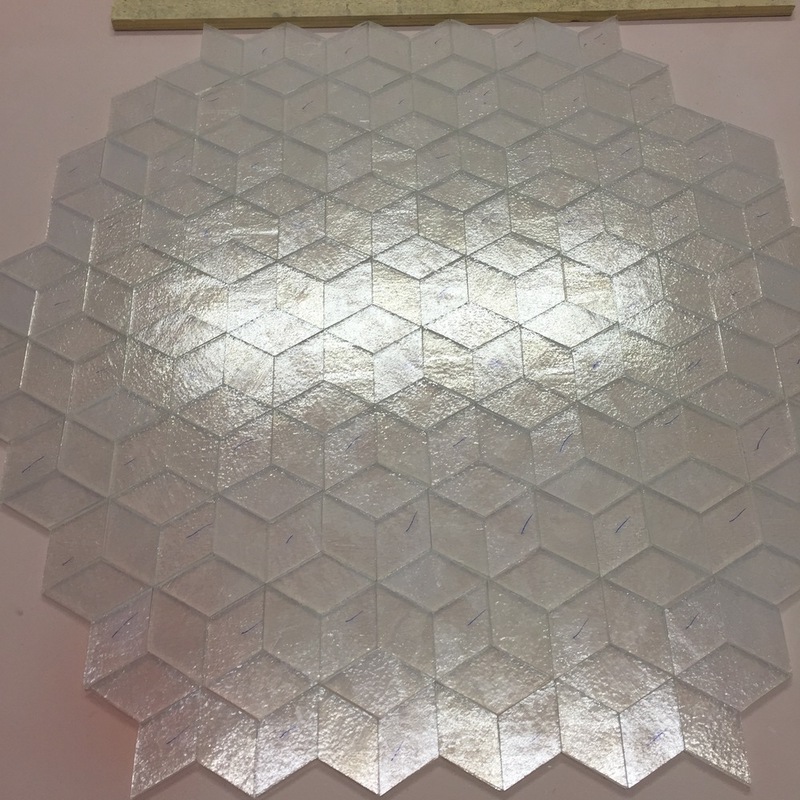 Once the design has been laid into the geometric pattern, its placed onto a kiln shelf and fired in a glass kiln to temperatures around 800 degree celsius after the firing it creates a flat glass sheet where all the individual diamond shapes are fused together. Before the bowl can be fired again the disc needs to be cold worked this is where you used a flat bed grinding machine to remove the rough and sharpe edges, this take some time as you need to work from a course diamond disc to a finer disc creating a crisp smooth edge. After the flat bed grinder i then need to use a wet belt grinder to work the edge of the glass further to remove the fine scratches again this is done from a fine to a very fine diamond belt then a cork belt is used to polish the edges. After the cold working is complete the disc is ready to be fired once again this is called the slumping stage where the disc is placed over a ceramic mould and slowly heated at a lower temperature just enough so the glass bends and starts to sag with gravity and slowly take the form of the ceramic mould underneath. 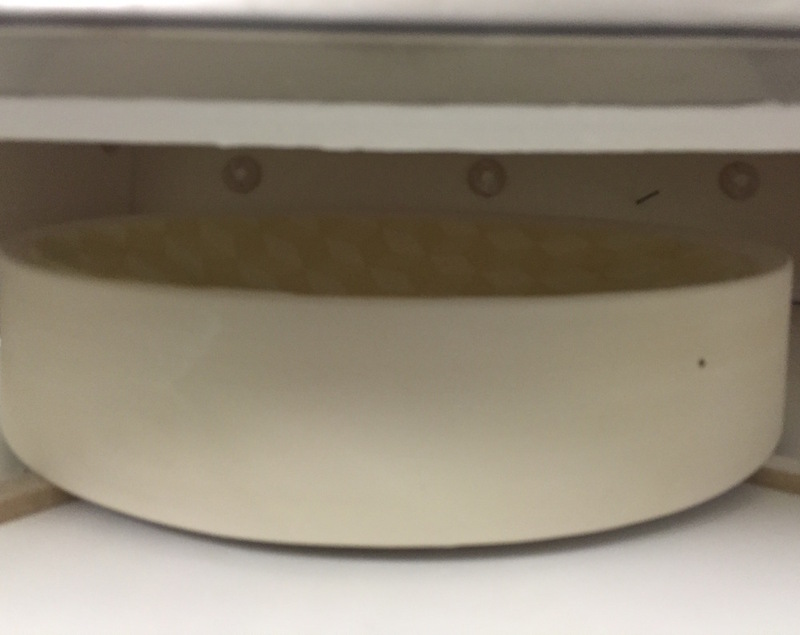 The mould needs to be coated with a release agent so the hot glass does not stick to the ceramic mould. A quick glimpse into the kiln to see the bowl taking its form, just long enough to take a quick snap if you where to look for a longer time you may corse stress in the glass, which in time would surely break. The final piece Translucent White Tumbling Blocks Bowl, this is one of my more complicated designs due to the colour of the glass before the piece is fired one small miss placed diamond out of more than 200 when laying out the design can mess up the geometric pattern and spoil the visual effect of three dimensional cubes.